It’s no secret- we’re trucking through a tough economy. When it comes to your car, you’re forgiven a little penny-pinching here and there. But in the long run, taking care of your vehicle pays off big… for your wallet and the environment. The good news is there are tons of simple car hacks that are dirt cheap or *gasp* free- all of which can contribute to a greener earth, safer streets and a more enjoyable driving experience. Let’s take a close look at one facet of driving that, more often than not, plays a large role in the car we choose to buy in the first place: gas mileage. Despite dramatic fluctuations in oil prices, we sometimes fall prey to the prestigious clunker rather than the most environmentally-friendly car choice. But no matter what automobile you own, there are ways you can streamline your driving habits for overall better gas mileage. 1) Treat your accelerator and brake pedals gently. When possible, avoid excess revving and sudden braking; these abrupt shifts contribute to unnecessary wear and tear on your auto parts and actually, yep, waste gas! Not to mention, that’s not the safest way to handle your car on the road. Simple concept: when possible, don’t rev, don’t stop short and you’ll improve your MPG, prevent the need for frequent repairs, as well as improve street safety. That’s a win-win-win. 2) Cruise at the speed limit and take advantage of cruise control. According to Fueleconomy.gov, gas mileage “usually decreases rapidly at speeds above 60 mph,” meaning for every five mph you drive above 60, you actually pay about $0.25 more for gas per gallon. That adds up! When you stick to the speed limit you can expect to save green and help save lives. Also, if your car has cruise control technology, use it! When you’re on a long stretch of highway, cruise control gives your foot a rest and effortlessly maintains constant, safe speed. 3) Idling in life and idling your engine… wasteful and worthless. When you idle your engine, you’re… well, you’re not going anywhere. You’re literally getting zero miles per gallon while using up gas. You’d never invest in a car that gets such pitiful mileage, so why shoot yourself in the foot by sitting parked somewhere with the engine running? Keep in mind that if you idle in an SUV or van, you waste even more gas than a standard sedan or other smaller vehicle. Save gas and unleash fewer emissions out into the environment- turn off that engine, or get a move on! 4) Clean out the clutter. Cart the essentials. Did you know that the more weight you carry in your car, the more you diminish your car’s potential gas mileage? Fueleconomy.gov points out that every “extra 100 pounds in your vehicle could reduce your MPG by up to 2 percent.” (In contrast to hack #3, excess weight hurts smaller cars more than larger cars because the latter are built for heavy loads.) Emptying the unnecessary junk out of your trunk is a smart, simple step towards enhancing your gas mileage and making the most of each gallon. 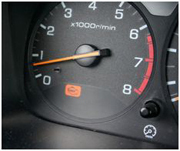 5) Stay in tune with your tires and engine. Properly tuned engines and adequately inflated tires are another win-win-win: they make for safer driving (by helping avoid blowouts and engine failures), save you money on unpredictable, preventable maintenance problems, and actually improve gas mileage by up to 40%! Stay on top of these essential components of your car and you’ll reap the benefits in the long run. This is just a sample of the simple hacks you can take to the streets daily (for free!) to help improve your car’s gas mileage, save some cash, give back to the environment, and be a more responsible driver. Have some hacks of your own? Share them below in the comment field!